David K. Dickinson, EdD, is a professor at the Peabody School of Education, Vanderbilt University. He received his doctoral training at Harvard University's Graduate School of Education after teaching elementary school in the Philadelphia area for 5 years. Since the early 1980s he has studied language and early literacy development among low-income populations, with a focus on the role of oral language in literacy development. 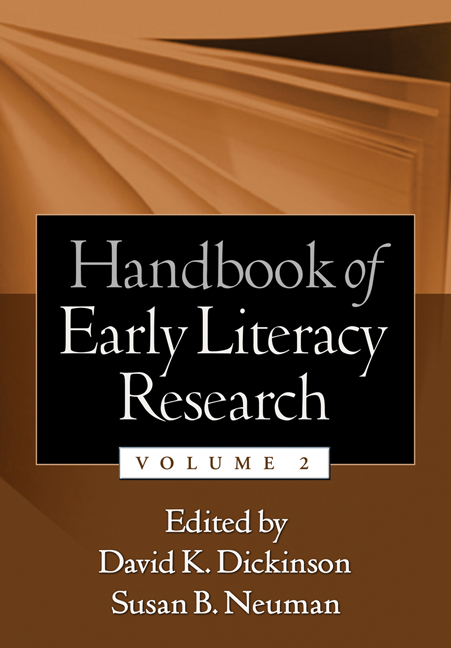 Dr. Dickinson has examined the interrelationships among language, print skills, and phonemic awareness and has conducted detailed studies of language use patterns in early childhood classrooms. He helped create tools for describing literacy support in preschool classrooms, and developed and studied approaches to providing professional development for preschool teachers. Widely published, Dr. Dickinson has served on numerous advisory boards and recently was on a commission assisting the National Association for the Education of Young Children with revising its accreditation standards. Susan B. Neuman, EdD, a professor in educational studies specializing in early literacy development, returned to the University of Michigan in 2004 after a 2-year hiatus, during which she served as the U.S. Assistant Secretary for Elementary and Secondary Education. Her research and teaching interests include early childhood policy, curriculum, and early reading instruction. In her role as Assistant Secretary, she established the Reading First program and the Early Reading First program, and was responsible for all activities in Title I of the Elementary and Secondary Education Act. Dr. Neuman recently received an honorary doctorate from the California State University-Hayward, where she also conducted her master's work in reading and curriculum. Widely published, she received her doctorate from the University of the Pacific in Stockton, California.